If you want to make a big impact and put the competition in the shade, you’ll need an exhibition stand that has the elusive wow factor. But how can you make sure that poor planning doesn’t let you down on the day? 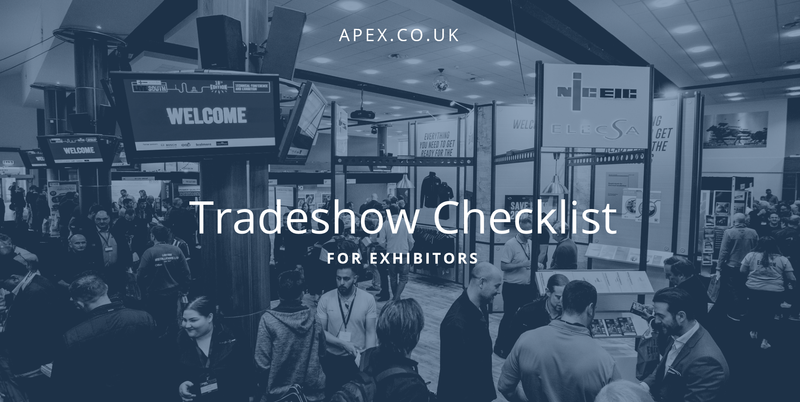 Brought to you from the experts at Apex, our handy checklist ensures your tradeshow presence is maximised. Lead capture. Capitalise on your exhibition presence, long after the show is over. Apex has over 30 years experience in events and exhibitions and a philosophy based on exceptional service, expertise, and innovative solutions. To find out more about how the Apex team can help you, give us a call on 01625 429370 today.